Our solutions — rooted in science and economics — reward protecting the environment, not exploiting it. "EDF doesn't just talk about problems," says Michael Bloomberg, an EDF supporter and founder of Bloomberg LP. "They help design smart government policies, combine them with private sector know-how and create solutions." We're harnessing one of the most powerful forces in the modern world — the pursuit of profit — to protect the environment. Our work with strategic partners of all kinds, such as landowners and businesses, is a big part of what makes us different. We have a long tradition of collaboration, because the best environmental solutions come from having everyone pitch in. We use the latest science to identify the most serious environmental problems and most effective solutions. 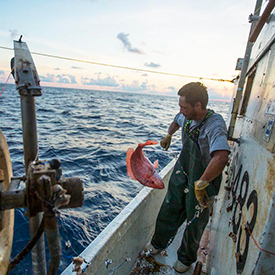 Problem: Red snapper stocks in the Gulf of Mexico were plummeting in the 1990s, due to overfishing. Solution: In 2007, Gulf fishermen and fishery managers worked with EDF to start managing fishing sustainably, giving fishermen scientifically determined shares of what they could catch. Results: The fish population started to rebound. By 2013, Gulf of Mexico red snapper was taken off the “avoid” list compiled by the Monterey Bay Aquarium.